The Indian company Coromandel Fertiliser Ltd last week for the first time acquired phosphate rock from occupied Western Sahara. On the afternoon of 16 January 2019, local time, the bulk vessel SBI Jaguar arrived the port of Visakhapatnam, India, with a cargo of phosphate rock from occupied Western Sahara. The vessel had departed El Aaiún in Western Sahara on 12 December 2018 carrying approximately 60.000 tonnes of the mineral. 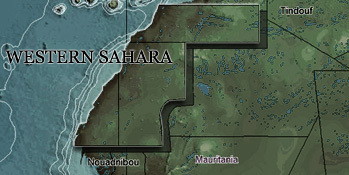 The trade is seen to finance the illegal occupation of the territory, and Morocco's exports take place in violation of international law and rulings. From what Western Sahara Resource Watch has been able to establish, the importer is Coromandel International Limited. The vessel only spent 36 hours in port, and WSRW believes that only a smaller part - perhaps around 10.000 tonnes - of the vessel's cargo was destined for Coromandel. After completing its mission in the port, SBI Jaguar departed the harbour of Visakhapatnam in the early morning of 18 January, heading further north along the Indian coast. When it arrives at the port of Paradip, it is to discharge the remainder of the cargo, destined for the Paradip-based company PPL, that has already been involved in the controversial trade for some time. WSRW on 18 January sent a letter to Coromandel to ask whether it had fulfilled the legal requirement of obtaining prior consent from the representatives of the territory for such trade, and whether this was a one-off import. Coromandel is, according to its own 2018 annual report, the second biggest phosphatic fertiliser player in India. The company is registered on the National Stock Exchange of India, and has several large international investors among its owners. According to its latest annual report, the Norwegian Government Pension Fund, which has systematically blacklisted companies engaging in the controversial trade which it considers a "particularly serious violation of fundamental ethical norms" as of 31 December 2017 owned 1% of Coromandel International, at a value of 27 million USD. SBI Jaguar is owned, operated and managed by Scorpio Commercial Management from Monaco, but sailing under the Marshall Islands flag, IMO number 9700055. Scorpio was also behind the last ever shipment of the conflict mineral to Europe, on board the vessel SBI Flamenco, which in September-October 2016 transported 75.000 tonnes of rock from Western Sahara to the port of Klaipeda, Lithuania. WSRW contacted Scorpio on 14 June 2017 on the email address operations@scorpiogroup.net, but did not receive a response. It is not normal that competing companies share the cost of shipments, as is the case now with the SBI Jaguar. For a number of years, the importers in Venezuela and Colombia shared the cargo costs. The two Latin-American countries are among the many that stopped the trade during the last years. The number of importing countries has been reduced from 13 in 2011 to 3 in 2019 after more information about the trade and its legal, ethical and human rights implications has surfaced.